Fancy tree made by a coworker -- such fun! 1. Slow and steady. Be the tortoise, not the hare. Easier said than done, when I feast my eyes on all the wonderful patterns out there that I just want to make NOW. But when I'm overwhelmed by choice, I end up not making anything at all. So...choose one and make it start to finish. 2. And in a related resolution -- get back on track with my Make a Garment a Month challenge. 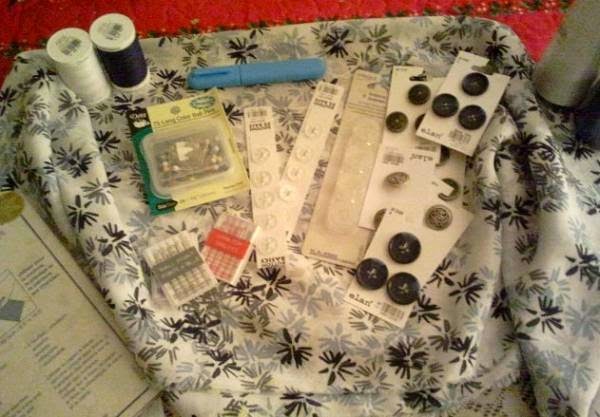 Having the support of other sewists who are doing the same is really helpful. I must continue! 3. Another related resolution -- finish those UFOs one way or another. Finish sewing them, or decide to let them go. 4. My final resolution: learn new skills. I have signed up for a number of Craftsy classes and I'm halfway through a couple of them. I want to watch them in full, and then work through them to learn better fitting skills, and some new tricks and tips as well. 5, And another extra one -- keep going with my embroidery and get enough practice in to actually get good at it! Those are my sewing goals. I have so many patterns and so many lengths of fabric in my sewing corner that I've got to get some projects made just to keep from being buried under a fabri-lanche. 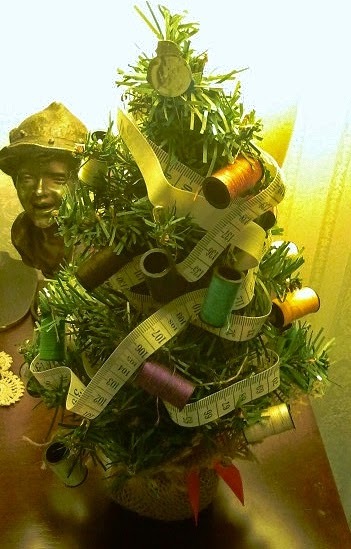 I wish all my fellow sewists a very happy New Year and abundant Sew-Jo in the months ahead! Fun long-distance gift from my best friend. Does she know me or what! Great resolutions and a perfect little tree :) Hope you are able to keep it and use it again next year. I am so inspired by your blog that I'm sure it will help me with my resolutions, too. Happy New Year to you! we share two for sure - finishing UFOs & trying new things (and maybe adding new skills if I'm lucky!) here's to 2015!